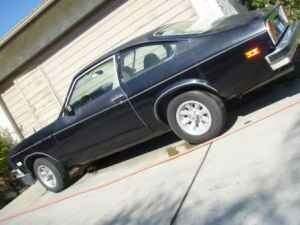 1976 Cosworth Vega For A Block-Splitting $3,000! Vega is the brightest star in the constellation Lyra, 25 light years from Earth. With an equatorial rotational speed of 274 km/s, it's a good namesake for today's high-revving Nice Price or Crack Pipe contender. After giving the world the GTO, but prior to his dalliance in pharmaceuticals, John Z. Delorean took an interest in the then gestating GM small car engine that would eventually power the Vega. Always looking at ways to capitalize on existing resources, Delorean had the notion that the high-silicon aluminum four would be a good basis for a racing engine. Lacking the experience with small, rev-happy engines internally, he reached out to Keith Duckworth of England's Cosworth Engineering for help. Duckworth headed to Detroit to evaluate the two litre four and declared it sound as a pound. Development began at once. Seemingly cursed from its inception, the Vega faced quality issues, production strikes and lackluster sales. GM felt that what the car needed was a halo model to bring aspirational owners into the fold, and accelerated development of just such a car- powered by the Cosworth engine. Despite this desire to bring the car to market as soon as possible, Cosworth was having continuing challenges with the motor- suffering catastrophic failures of the block below the piston skirt, which would require a major redesign. Instead, GM ordered that the compression ratio be lowered from a stratospheric 12.5/1 to a kitten-fart worthy 8.5/1. As would be expected, the horsepower also dropped from a high octane-fueled 180 to a paper bag-challenging 110. Still, that was a number that could be touted in advertisements over the 90 ponies the standard Vega managed to strangle while grinding itself to pieces. 60 miles per hour came about in a leisurely 12.5 seconds making the car competitive with many diesels and student-driven cars that were then on the road. Available in only the hatchback bodystyle, the Cosworth Vega was introduced in 1975 to car-buying public who had already written off the Vega as a purchase option. That year, you could get the car in any color you wanted, as long as it was black with gold trim. In 1976, a white and gold option was also made available, with the thinking that color was the reason for the cars collecting dust on dealer lots, but sadly it didn't help, and the model was discontinued after only two years, and 3,508 having been built. Today's candidate has the traditional John Player Special color scheme, and hails from that last year of production- 1976. At a $3,000 asking price, it's less than you'd spend on a good bender in Vegas, and at least the car might get you home after said bender. The seller doesn't say much about the condition, other than that it's a project, not a show car, and that daily driving has ensured a strong motor, which, when considering the Vega, is not typically the case. So what do you think of this piece of GM history, is that three grand asking price nice enough to make this the brightest star in your driveway? Or is that a disintegrating aluminum bowl full of crack that the seller is smoking? City of Angels Craigslist, or go here if the ad disappears.